IWC today unveils three new Da Vinci watches to preview its SIHH 2017 debuts .as the Schaffhausen-based watchmaker updates that collection in 2017. As these three sneak-peeks illustrate, IWC is primarily expanding its offerings for women with Da Vinci in 2017 but doesn’t neglect larger wrists with a few more complicated Da Vinci updates that will look familiar to collectors in love with the round-cased 1980s Da Vinci devised by legendary IWC watchmaker Kurt Klaus. 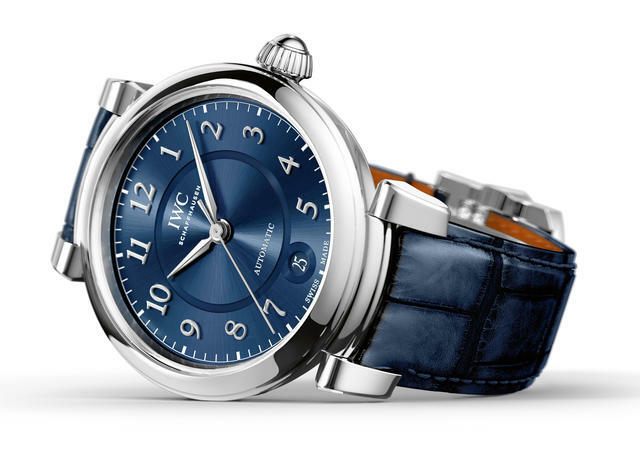 The primary attributes of the new IWC Da Vinci collection include all-round cased models as seen in the line’s 1980s designs, a change from the tonneau shapes found in the collection in the 1970s and again after 2007. IWC will focus on Da Vinci’s technical edge but will add an emphasis on Leonardo’ Da Vinci’s artistic “Flower of Life” renderings for caseback engravings and component designs. As a preview of its wider Da Vinci debut in January IWC today unveils the Da Vinci Automatic 36 and the Da Vinci Automatic Moon Phase 36 tailored to women, and shows off new technical combinations within a new Da Vinci Perpetual Calendar Chronograph. 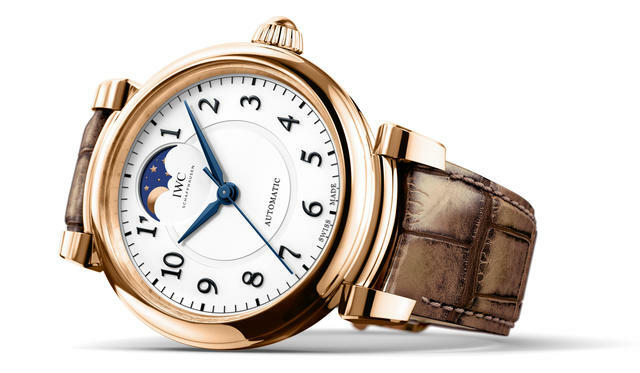 This is IWC’s first watch that combines hour and minute counters with the moon phase in a single subdial. This technical feat required a redesign of Klaus’s existing IWC-manufactured 89630 caliber, which had no room for a moon phase. IWC’s engineers combine the dual counters of the chronograph with the moon phase mechanism to now display them on a single subdial. This enables stopped times to be read off as if they were the time of day. The blue central chronograph hand shows stopped times to an accuracy of one-quarter of a second. The chronograph utilizes two pushbuttons to start, stop and reset the hands and to activate the flyback function. A silver-plated or gold-plated disc depicts the full moon on the dial of this 43mm watch. At the same time, the rounded, dark blue section of the disc – representing the earth’s shadow – rotates to show the waxing or waning moon within a star-studded night sky. 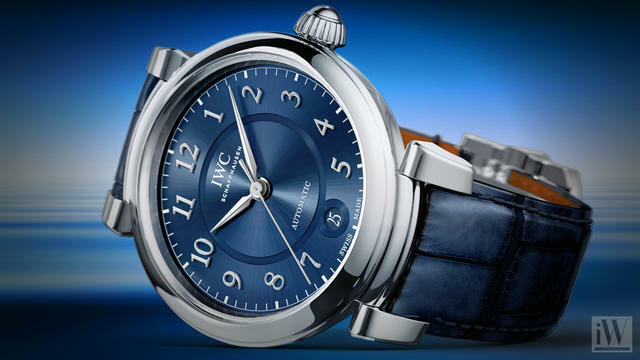 IWC has also redesigned the crown and the pushers in this next-generation Da Vinci. Instead of round or mushroom-shaped pushers and crowns as in previous Da Vinci models these elements are now cylindrical. The perpetual calendar itself retains the centuries-long precision of its forebears. In 577.5 years, the display will diverge by just one day from the moon’s actual course. The perpetual calendar displays the date, month and day of the week on three subdials of the same color at 3, 6 and 9 o’clock, respectively. And, in a nod to one of the most cherished features of the 1980s Da Vinci, a small window in the bottom left-hand section of the dial reveals the four-digit year display. This calendar takes into account the different length of the months and even the leap years. How accurate is the calendar here? Only once every 100 years will a watchmaker will have to advance the calendar manually. Of course, for those thinking ahead, in 2300 IWC advises another intervention as the current century slide (with 20, 21 and 22) will need to be replaced with a new one for the years 2300 to 2599. On the red gold model pictured here the case, horns, crown and push buttons are all made of solid 18-karat red gold. A gold folding clasp holds the dark brown alligator leather strap by Santoni. 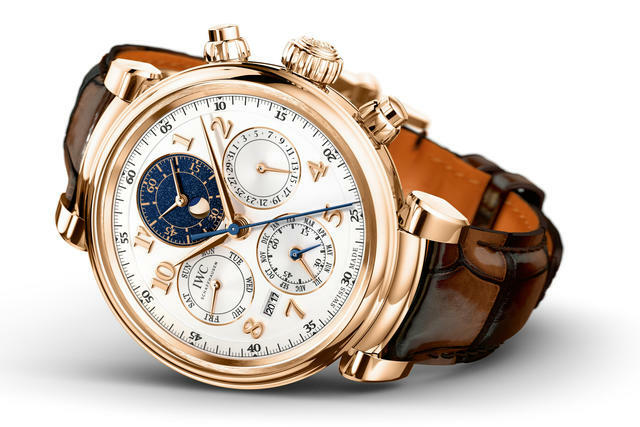 The IWC Da Vinci Perpetual Calendar Chronograph is available in two versions: 18-karat red gold (pictured) and stainless steel. Price: Approximately $44,500. The steel version will be available with an accompanying $13,000 drop in the retail price. IWC has long made watches for women. In the late 1800s women could purchase smaller-diameter IWC pocket watches made especially for them. And from the 1920s through the 1950s IWC dutifully, and very successfully, manufactured and marketed all manner of ladies’ models. More recently the brand’s more feminine offerings haven’t been its focus, but the success of last year’s 36mm Pilot’s Watch Automatic with men and women and the ongoing feminine interest in the 37mm Portofino models that debuted in 2014 has emboldened IWC to broaden its offerings to women. This venture yields a wide range of ladies’ watches scheduled to debut in 2017. The first two available to inspect are these 36mm examples: a moonphase watch in rose gold and a three-hand automatic watch with date set into a stunning blue dial. The new collection features a simpler Da Vinci bezel design and a more contemporary hand/dial profile. Expect more variations from each of these collections when the entire new IWC Da Vinci collection is shown in Geneva this January. The moon phase display, which entered the Da Vinci family in 1985, is the focus of the new silver-plated dial on the Da Vinci Automatic Moon Phase 36. The gold- or silver-colored moon (depending on the model) moves clockwise against the dark blue night sky. The gear train advances the disc automatically by a single tooth each day to depict the correct phase of the moon. When necessary the wearer can adjust the display via the correction button at 2 o’clock using the pin supplied with the watch. 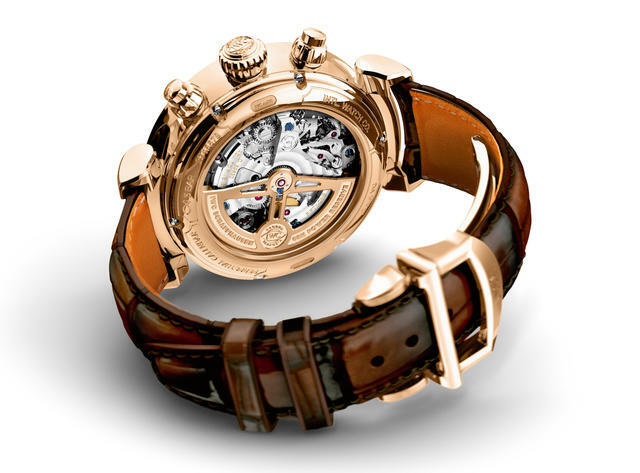 The Da Vinci Automatic 36 pictured here is one of four versions set to debut in January. Here, the new dial design is most visible. Note a recessed inner circle with a semi-circular crown and a round date window. IWC has also fashioned a new three-wing butterfly clasp and a lug design that easily conforms to the wrist. IWC has engraved Da Vinci’s so-called “Flower of Life” on the casebacks of all Da Vinci Automatic 36 and Da Vinci Automatic Moon Phase 36 models. 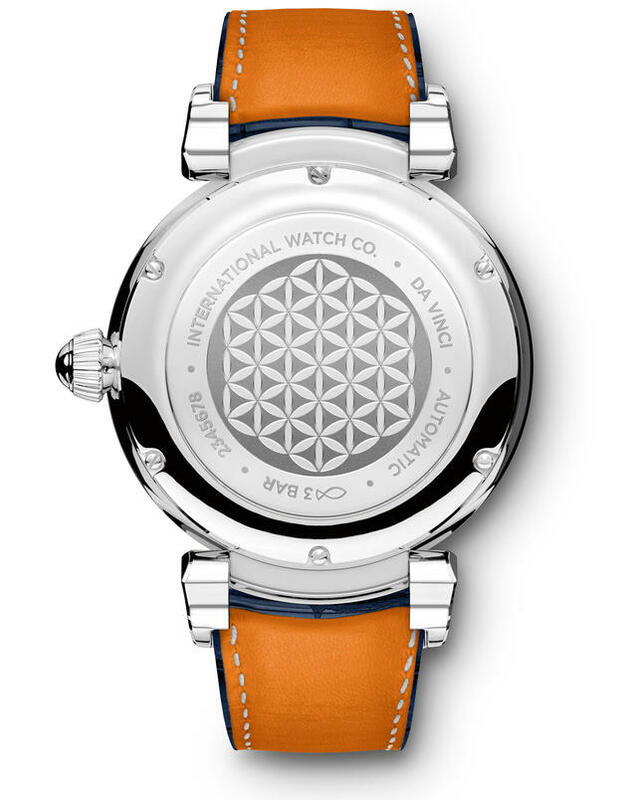 As it represents Da Vinci’s search for mathematical rules for beauty and proportions, this design has been tapped to symbolize the approach IWC has taken with this Da Vinci watch collection. (Prices not yet available.